Apart from Insulated vehicle bodies, we also fabricate Metal Bodies for sizes depending on customers requirements like Beverage, Water Carriers, Dry Goods etc. 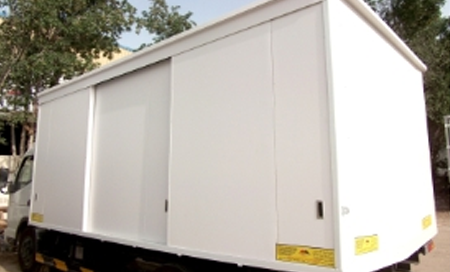 These bodies come with Sliding / Leaf doors or Shutter, with the option of having internal partitions. The body frame is made of Hollow tube or as per customer requirement and outside Cladding will be of Mild Steel. 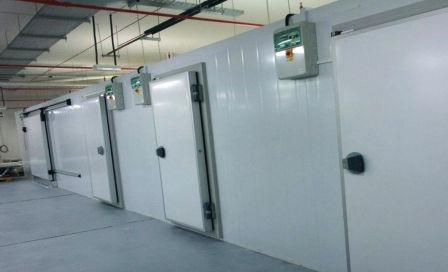 Polyurethane Sandwich Panels are manufactured at our factory for constructing Walk-in-Chillers and Freezers in standard sizes, with internal volumes ranging from 4000 liters to 20000 liters suitable for temperatures between 0°C and - 40°C. Assembly of a typical walk-in-cooler takes about minimal man hours only. Non-standard sizes are available for specific requirements. Hwasung Thermo is the first and No.1 Transport refrigeration manufacturer in Korea and also known as the OEM supplier of Hyundai and Kia Motors. Through meaningful innovation in the transport refrigeration unit industry. Hwasung Thermo has exported in more than 40 countries worldwide. Headquarterd in Kyonggi-Do, Korea, Hwasung Thermo has subsidiaries, the international sales in Seoul, Korea. Insulated sandwich panels manufactured at our factory comprising on-site filled polyurethane rigid foam core, sandwiched between two metal skins, in a single step process. Panels are in modular sections that are connected easily to each other by a special integral locking system called Tongue & Groove locking mechanism to enable quick and simple assembly and dismantling. 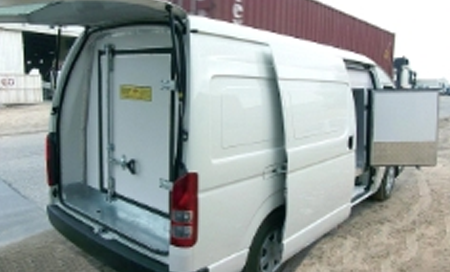 Tail lifts can be fitted as per customer requirements with 1 / 1.5 / 1.7 ton lift capacity. The passage from the platform to the vehicle floor is realized by an articulated bridge plate, available as option on this lift. The lift concept has been engineered to maximize the ground clearance under the lift, and to reduce the cut-outs in the rear cross member of the vehicle floor to a negligible minimum.